The palm oil’s boycott threatens the achievement of the United Nations’ Sustainable Development Goals (SDGs). Food and food trade companies that are using “free from palm oil” labels are responsible for this failure. Palm oil is the only supply chain that is making a relevant contribution toward the achievement of the United Nations’ SDGs. It is a value chain ​​that includes producing countries’ governments, small and large farmers, refiners, various industries and consumers too. This remarkable supply chain has been acknowledged and appreciated by international organizations and institutions, including the UN and the Food and Agriculture Organization (FAO). A SUSPICIOUS DOUBLE STANDARD The same cannot be said about other vegetable oils, whose supply chains are very far from the benchmarks set by the palm oil industry. Yet, some non-governmental organizations (NGOs) continue to be more preoccupied about palm oil, while ignoring other vegetable oils. Why? It represents an extraordinary resource for economic growth and improvement of living conditions: access to education, dissemination of knowledge and innovation. These are the main factors that favor more sustainable production processes. lower production costs especially when considering high yield. These characteristics provide us the answer to our question: Palm oil is boycotted in Europe because it is more competitive than sunflower oil, rapeseed oil or any alternative energy resource. Europeans cannot accept this fact. By boycotting it, they are putting at risk the achievement of the UN SDGs. By favoring other oils, Europeans left the path to a more sustainable world. The international community, as well as the European Commission and member states, shall promote the use of sustainable palm oil. Exactly the opposite of what they are doing to protect the interests of less competitive and sustainable products. COLLUDED NGOs It is unfortunate to denounce the inconsistent, and sometimes harmful, behavior of NGOs. Their contribution toward the improvement of palm oil sustainability, in the past, has undoubtedly been useful for stimulating and making the supply chain more accountable. We would like them to explain why they do not put the same effort and commitment with other crops. We also would like them to explain why they do not prosecute industries (cattle) and governments (Russia) that are scientifically acknowledged as the primary cause of deforestation. It is clear that they prefer to fight useless ideological wars, that exploits poor orangutans, rather than developing policies and practices to foster better living conditions for millions of people. THE OTHER FACE OF HYPOCRISIS Food companies that have replaced palm oil with less sustainable alternatives, however, have to be held more accountable than NGOs. They have fooled the public: their move is exclusively a commercial strategy that aims to take advantage of consumers’ emotions.They use fake news and unscientific information to mislead consumers. Italian and Spanish food and food trade companies are leading the way in Europe by promoting deceptive slogans that delude consumers. WE APPEAL TO SCIENCE AND GOOD SENSE We call Europe and member countries to forbid the claim “free from palm oil” as well as other similar claims because they are misleading and discriminatory! We call the UN to protect this industry and countries that are committed and are investing in the sustainable palm oil supply chain. Those companies who abandon this path are denying the urgency of investing in sustainability. 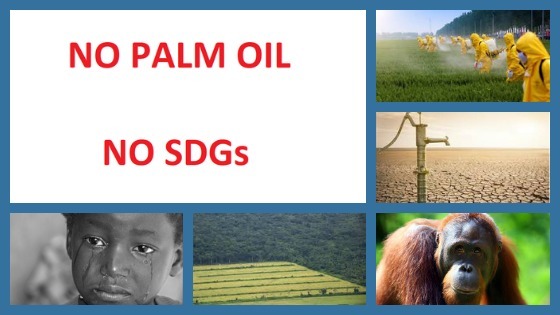 Who says no to palm oil, says no to SDGs! We call the international community to encourage the development of responsible supply chains and stringent criteria also for sunflower oil coming from France and Ukraine, or rapeseed oil coming from France and Switzerland. These alternatives must commit to more stringent sustainability criteria and they must develop their own certifications. If this does not happen, the suspicion that sustainability was just an excuse to commercially hit a much more competitive supply chain – like the one of oil palm – would be confirmed. As of now, we are convinced that even with the highest levels of sustainability achieved by Indonesia, Malaysia and Colombia, the EU and NGOs will continue with unfounded accusations and unfair threats.